"​The job took a little longer than expected but since we started in November weather was an issue. Jack was very good to work with throughout the project. He really knows construction and was personally involved with most of the work to make sure it was done correctly. He was also very good at communicating when issues came up or when when there were options that he wanted to describe to us and have us make a decision. He was also a great ad\focate for us. He had to call in a plumber to make a repair when one of our old corroded faucets broke. The plumber tried to charge us $750 for the repair, Jack call d himonit and the plumber cut the bill more than in half.. In all we had the entire house stripped down, weather shield wrapped and sided with Hardie Board. Had five windows and two doors replaced, including a beautiful Marvin sliding French patio door and two Marvin wood frame double hung widows in the kitchen. A new cedar deck prefinished and installed as well as painting the entire house. The quality of the workmanship both inside and outside the house was very good. Jack also had the gutters replaced because he didn't like the look of the old ones and they were making the siding installation difficult...no charge! We needed to have siding replaced as well as some windows and doors. We also needed to have a deck rebuilt. Three other contractors came out to estimate the job with their tablet computers and laser measuring devices and not one came through with a timely proposal. Jack came out with a tape measure and a note pad. I had his handwritten proposal e­ mailed to me in less than three days and he apologized for taking so long! He gave us a quote to side the South and West sides of the house, which were what we needed done and also a proposal to side the entire house. With the discount he offered to do the entire house we decided to go that route and are glad we did. The house looks fantastic! "Jack does quality work at a fair price. He does the extra things to make sure his customers are satisfied. 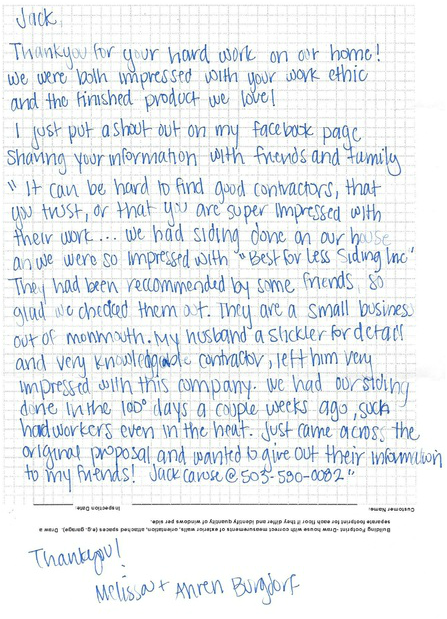 he has done complete siding jobs on two houses for me and I would hire him again!" 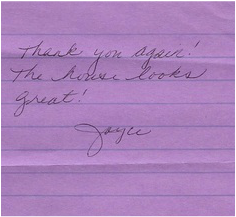 "The work was very good! I added trim around the windows and he notched them to fit flat and tight to the house, something I noticed other contractors fail to do, an extra that really pleased me." "Good price. On time. Great craftsmanship." "We had a list of three contractors whom came out and gave us estimates. 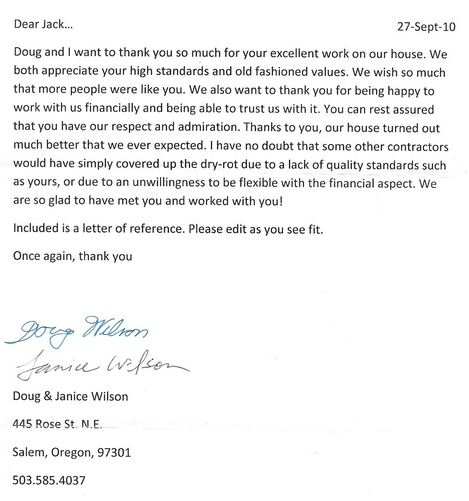 We checked each one's reputation very thoroughly, through several contractors groups, and we contacted the numerous references they provided. We went to people's houses and viewed the contractors' work. 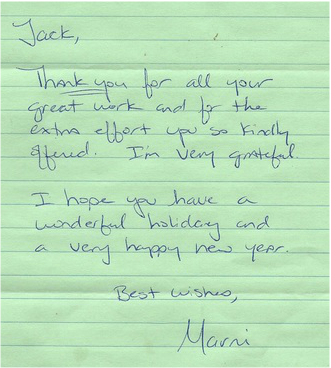 We were most impressed by the friendly and accommodating reputation Jack left with his clients. From the day we met Jack, we could tell that he was serious about a job well done. Of the three contractors we interviewed, he was the only one that said “If it were my house…” and we took that to mean that he cares about the work he does that other people live in as though he were to live in it himself. He was very accommodating to my night-shift schedule even though it meant he could not do work during the day while I slept. He did show up in the evenings and all weekends. His “hired-helpers” were very competent and respectful of our needs as well. There were no blasting stereos or cigarettes flung about or cursing. His three helpers that we met were professional and knowledgeable adults. Jack even went on to explain why he chose these people, in that he had worked with them on many jobs and had seen their abilities compared to other workers he had since let go. He respectfully cleaned up after himself each day and my husband and I were never in danger of stepping on a nail or some other hazard. Every day was a day of progress and not a single day was wasted. He came to get the job done but did not hurry in any way that would compromise quality. My husband and I are very pleased with Jack and feel we got very fortunate in finding him. Jack believes in his word and will not say it if he doesn’t mean it. If our litigious society had room for it, I could count on Jack with a handshake. With no hesitation, we will hire him again. Of course we will still check his status on the contractors’ boards but we have absolutely no qualms about his reputation or his ability. I very highly recommend Jack for your house repair jobs, and I also recommend putting your trust in him on his ability to provide competent helpers. My husband and I originally hired Mr. Jack Course of Best for Less Siding to strip and repaint our old cedar siding and replace our 10 windows and our gutters. His correct observations of so many chunks of wood missing on various parts of the siding and the inconsistent dimensions of sporadic replacement jobs over the decades (our house was built in the 1930's) convinced us to just go ahead and replace it all with Hardie-Plank. In tearing off the old cedar siding, we discovered some significant dry-rot on the weather side of the house which required reconstruction. He and his knowledgeable assistant rebuilt that part and we also discovered the cause of the rot…a very shoddy job from the last time the roof shingles were replaced 16 years prior. Jack suggested replacing the shingles while doing the siding job. He gave us no pressure but very logically explained why it would be wise to do it now while it was all exposed. Once we were started on the roof, we noticed that it was weak in several spots and giving in to my husband’s weight (160 lbs). We found numerous rotten trusses that were not strong enough to support the next snow. Of course the bill was adding up but we could very clearly see that these were serious concerns and not just some contractor pulling a bait and switch. Jack understood our financial concerns so we discussed thoroughly all of our options and the consequences of each. Jack has a huge knowledge base for the business and uses it wisely, for the benefit of the home, the client and his hard earned reputation."